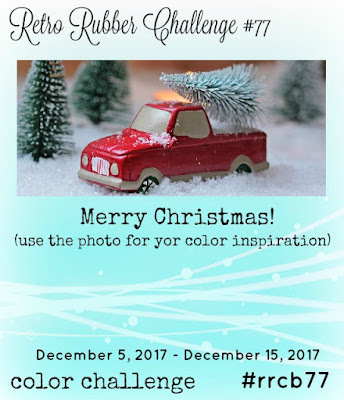 I recently discovered the Retro Rubber challenge blog, a blog where older stamps are being highlighted, and I played along in a few of their challenges. One of my recent cards was a favorite and the team invited me to join them as a guest designer (thank you so much!! ), so today I am sharing my card for the Retro Rubber challenge. The theme is Christmas Colors picked from the inspiration photo below. This stamp was another oldie I found on ebay last year from PSX, probably around 15 or so years old, no longer in production, but it can still be found on ebay or etsy. Stamp #K2431. I heat embossed the image on bristol vellum card stock and used my Zig Clean color markers for coloring. The sentiment comes from an old Stampin Up Christmas set, it is also heat embossed. I used gold twine and gingham ribbon as embelliments. I even used really old designer paper I still had left over from when I was scrapbooking. Yes, that's a long time ago! The Retro Rubber challenge runs for 2 weeks, so if you like to play with your older stamps why not link up there! The stamps don't have to be as old as the one I have used, but at least one year old. Absolutely GORGEOUS! LOVING the colors!!!!!!!!!!!! Gorgeous card and beautiful colouring. This card is stunning!! I love the "Currier & Ives" feel to it and your coloring is just perfect!! I do want to make sure any of your followers see that the challenge only runs till December 15th, not till the mid-January. Thank you SO MUCH for playing with us at Retro Rubber as our guest designer!! I hope you will be back in our gallery again soon. Happy Holidays! 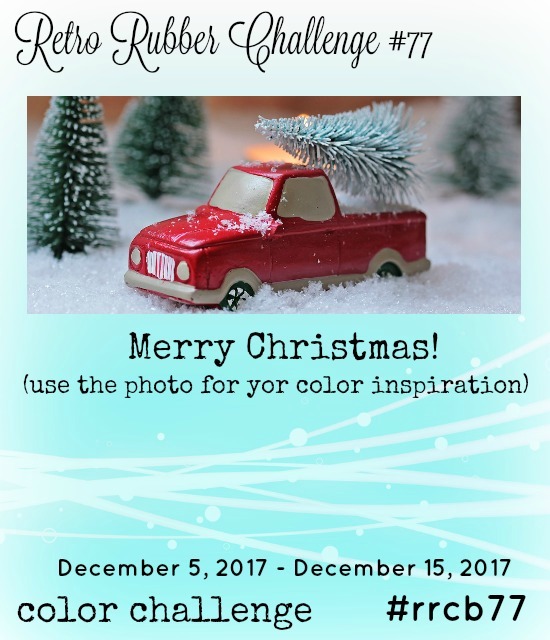 A "Retro Rubber Stamp Challenge"? I love it! I may have to play along sometime. I love this retro image and what you did with it. Great job! It's great to have you join us this week at Retro Rubber Challenge as our Guest Designer. Your card has such a lovely vintage-Christmas feel to it, with the traditional colours, image and handwritten font. Such gorgeous colouring - I'm envious! Ellibelle! This card is really so so beautiful! You have done an amazing job with coloring this image and pairing it so well with the ribbon and paper! Thank you for joining us as Guest Designer! It has been a delight to show you off!